In a large bowl, toss together 3/4 cup breadcrumbs, crab, shrimp, green onions, celery, mayonnaise, Worcestershire sauce and parsley. Mix well, and spoon mixture into clean, dry seafood shells or ramekins. 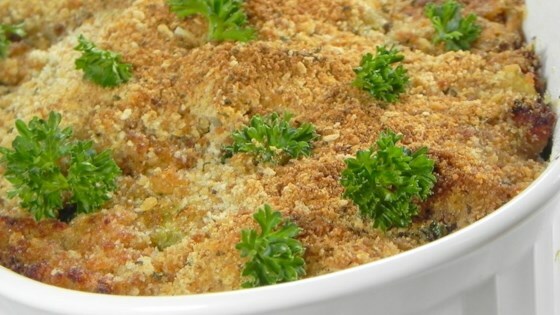 Place stuffed shells on a foil-lined cookie sheet, and sprinkle with remaining 1/4 cup bread crumbs. yum! I don't have ramekins, so i wrapped seafood mixture in one layer of hungry-man biscuit dough. It was a party hit! This recipe is great and easy to make. I tried it and I'm going to make it for Christmas dinner for my friends. this was just ok,it really needs seasoning. YUMMY! EVERYONE THINKS I MUST HAVE SPENT A LOT OF TIME MAKING THESE! FOOLS! !